These characters were made for an online card game. 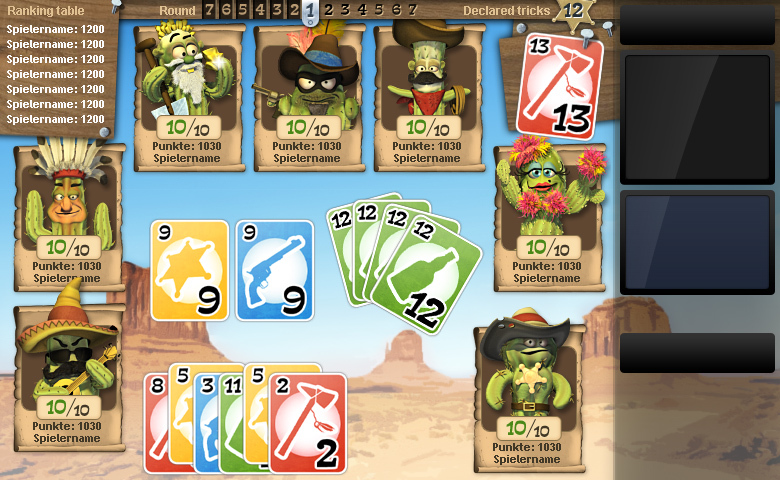 The german name of the game can be translated as "sting", which gave the idea to use different cactus figures in a western setting. Again, the original character designs (2D sketches) were done by Andreas Timmelmayer. The timeframe for the 3D production was pretty tight. Therefore it was necessary to reuse and optimize as much as possible. Even though all characters look very different they share one common structure. In the end I was able to model, animate, and render the final three (of seven) characters within just four days. There are also many different materials including feathers and fur. The right lighting also turned out to be crucial for an appealing look. Screenshots, animations, and a video from the game. © Mig Marn - all rights reserved.